Hello there, TFG fans. My name is Luke and I’m a 3rd edition 40k veteran who recently returned to the hobby for 40k, AoS, and some other games. 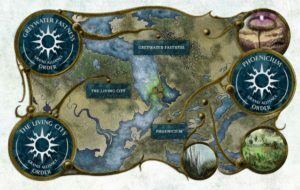 I’ve also been a repeat guest on the Veterans of the Long War podcast(which is different from The Long War podcast) and today I’m here to provide some thoughts and perspective on the recent Season of War campaign event for Age of Sigmar and compare it to two old worldwide campaigns GW did back during my first stint of playing. The Season of War is over in the Eight Realms and Ghyran has managed to hold back the forces of Chaos, Death and Destruction. 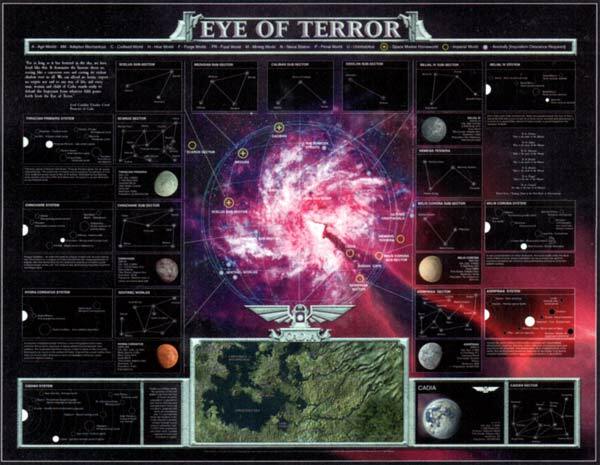 However, this is not the first time Games Workshop has plunged us into a world(or galaxy) at war. 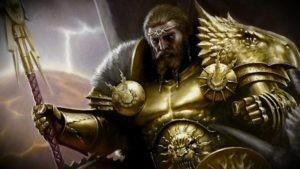 Today, I’m going to discuss what I think about the Season of War, how it was handled, and how it compares to campaigns of years past when I first was part of the hobby. The Season of War was beautifully handled in my opinion. While of course there was the chance people were cheating and reporting false games, I highly doubt that was a heavy factor in the campaign’s results. The fact games and/or warscrolls painted had to be reported to your local store really cut down on potential cheat factors. It also allowed for a very lovely graph allowing you to see how the four Grand Alliances were doing not only at your store, but any store you wanted to see. I feel this aspect of things not only supported people going to their FLGS or local GW, it facilitated a creation of community effort. Players in my area who had mostly just been casual players or playing routinely with friends were suddenly setting up times to meet and play at both stores I frequent simply because there was this sense of a chance to influence the game’s world and also to back up our preferred Alliances and it’s truly been a marvelous move on GW’s part. Another aspect to the Season of War that has made me extremely happy is Games Workshop directly emphasizing hobby is just as important as playing. This is something in years past that was enforced at GW events to a degree, but it was never implemented in a campaign as a way to garner results for your faction. As with the sense of community, I saw people at both stores I go to who either don’t paint often or who paint slowly doing their best to get warscrolls done they planned to use for the campaign. I’m sure a lot of people got a lot of units done over the course of the month and I believe it’s encouraged people to continue the practice. My only true disappointment in the campaign is that it never truly seemed like Order was at risk of losing anything in any of the three “zones” the world was divided into. I saw some stores near me were controlled by Chaos or Death, but I never saw Order at risk of going below 60 to 65 percent in any of the three cities. I’m unsure exactly what the cause was, but I believe the fact Order has way more factions than the other Alliances(except perhaps Chaos) and that Order had just recently gotten the incredibly powerful Sylvaneth Battletome to be heavy influences on this. 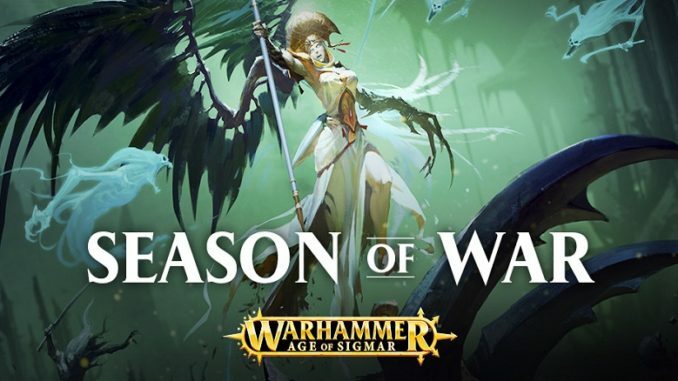 It’s something that makes me feel GW should’ve waited another year until more factions had Sylvaneth-style Battletomes and rules of their own to help balance things across the four Alliances. 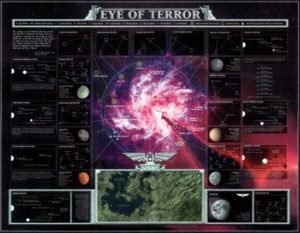 Now for my comparisons where I will start with the event I took part in way back during the original 13th Black Crusade, the Eye of Terror campaign. It was third edition 40k with fourth not too far off and GW still had web forums back then since this was before the days of Skype and Facebook. These were the dark years of forums and MySpace. The campaign was similar in some respects to the Season of War, but all battle reports were sent to GW directly via their site. There was no limitation on how many games you could report initially, and I believe this was changed to three a day during the summer as the campaign lasted several months. Your local store did not factor into any aspect of this. You could play at home, at the store, or even make up game results. You’d pick your race, and I believe the race of your opponent, and say how much you won or lost by(these were the days of Victory Points). 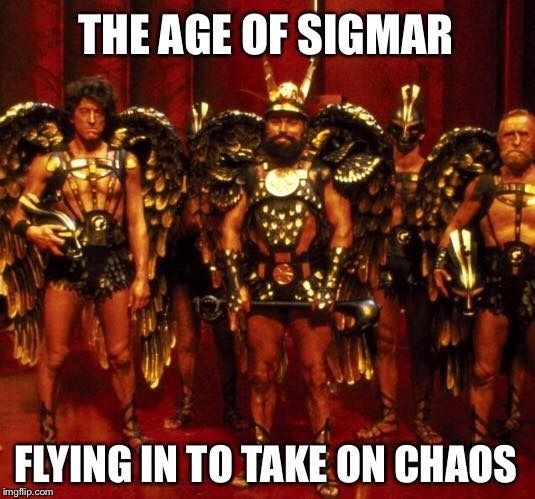 There were forums for Chaos and the Imperium and I believe the Tau, Eldar, and other xenos were given their own as well. You also chose what sector of the galaxy your win counted towards to help affect the results there as the map was not divided by real life world region, just 40k galaxy map areas. Players on all sides would coordinate in their forums to have people who paid attention to the forums send as many victories as possible to a particular sector in an attempt to overrun it. Cheating was a rampant issue but there was nothing put in place at any time to prevent people from making multiple forum accounts or just sending in fake battle results. There were forum spies, yes that’s right we had people spying via the forums to figure out who was attacking where and try to counteract them. However, while the cheating was sad, pathetic, and irritating…well the worst part was how GW wrapped the campaign up. Much like with the Season of War, we were promised the results of the campaign would affect 40k’s upcoming fluff. The Tau Empire had been stomping all summer while the Imperium and Chaos duked it out, expanding the Empire 120 percent. Chaos overran Cadia completely. The Imperium lost some areas to the Tyranids entirely if I recall. Well, apparently GW had pre-written the fluff results for the campaign. When this was released, there was a massive outcry as they said the Tau Empire expanded a mere 20 percent. Cadia was lost, but apparently the Imperial Navy had seized control of all space around Cadia and the Chaos forces on the planet were trapped and isolated so Cadia would be cleansed and remade. And so it was that the forces of Chaos accomplished…nothing. There was almost zero change to the world via the fluff, even after GW begrudgingly “apologized” for their pre-written travesty and wrote new fluff…which still amounted to almost zero change. The same sort of behavior from players and GW happened during the Storm of Chaos campaign for Warhammer Fantasy. The goal of the campaign was for Chaos to overrun a particular city in the Empire, I believe it was the city that the wolf god was from. I didn’t play Fantasy so I didn’t take part in this, but I watched it. I watched Chaos steadily coordinate via forums and take piece after piece of the map. I watched them spend all summer marching implacably toward this city with other cities falling to them. They made it to the wolf god’s city and were taking it over too, the very center most sectors of the city were all that was left…and then suddenly overnight Chaos was not in the city at all anymore. Miraculously, Chaos had been shoved out of every sector in the city to its outer walls. How? It wasn’t possible for enough games to be played and reported to force Chaos out of the city entirely. There were only two possible explanations. One is a whole lot of cheating occurred on the player end and thousands of false battles were reported with “Order” victorious. Or…Games Workshop didn’t want Chaos to win and just…altered the results. Making it so that with a final day or two left for the campaign, Chaos had no chance to overrun the city again. Once more there was outcry of rigged campaigns, false promises, rampant cheating, and Games Workshop just pushing people to buy models that just like the Eye of Terror became obsolete once the event ended. 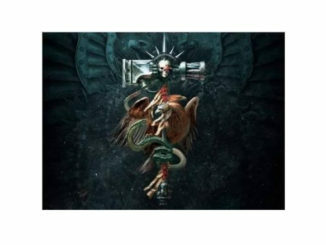 The 13th Black Crusade and Storm of Chaos both had a codex/army book released with special army lists in them. 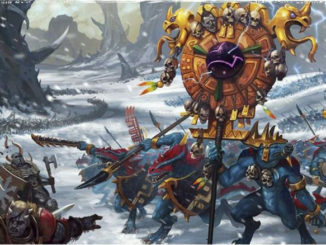 Models were released for these armies and it was in fact the 13th Black Crusade that saw the initial birth of a Space Wolf Wulfen army in the 13th Grand Company army list where everyone in the army was a Wulfen. Not long after each of these campaigns wrapped up…all army lists from said campaigns became obsolete or no longer tournament legal. A final stab in the back from old GW. Season of War’s fluff results are not yet entirely complete. We got some bits after the event ended but it’ll be some time before we see the aftermath fully realized. We didn’t have any special event-based armies. We had local retailers involved all over the planet. We had people focusing on hobbying and playing. Overall, I’m quite pleased with Season of War even though my Alliance didn’t even have a chance of taking a single city. However, part of me still worries and wonders…did Order solidly hold all the cities because of imbalance in the game? Because of cheating? Or was it GW making sure something they’ve already written doesn’t become incorrect? We’re in the days of Good Guy GW as I’ve heard said. I love a lot of what GW’s been doing these days and I am super hyped to see more, but sometimes old scars and betrayals still cause pain even years after the fact and that pain makes me wary. Hopefully you enjoyed this article as it is my very first. If you’re interested in hearing more hobby discussions, check out the Veterans of the Long War podcast I mentioned earlier. Also, if you’re in the Milwaukee, Wisconsin area or will be passing through there at some point in the future check out the hobby and gaming club I’ve started up called MAW: Milwaukee Area Wargaming. We’re partnered with a local gamer bar called Binary in West Allis and will be opening for play soon. If you’re at all interested, search for MAW on Facebook using the name above or @mawhobbyclub!